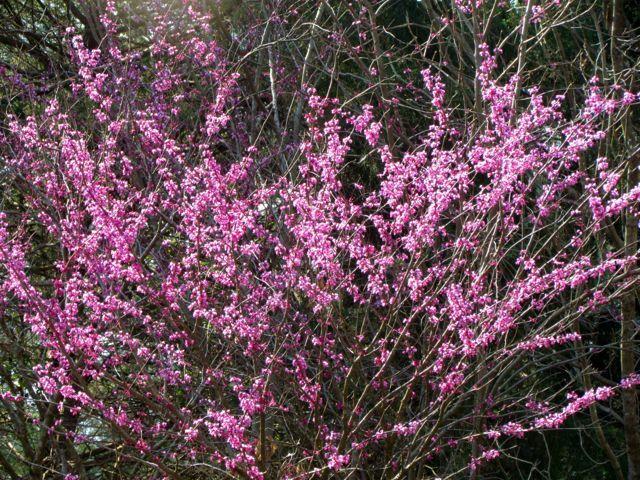 Redbud bloom color really pops against a background of red cedars. 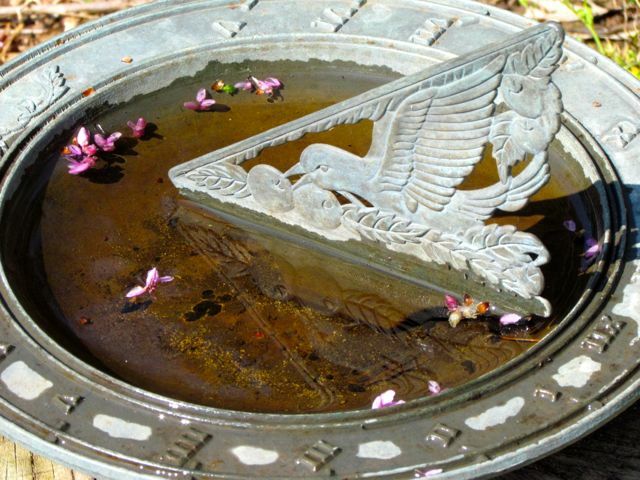 Along with all the flowers, native wildlife is suddenly more evident everywhere, especially the water-loving birds. In addition to the Wood Ducks that nest along our creek every spring, this year, a pair of Canada Geese has moved in. I see them paddling up and down the creek at dawn most mornings. They seem to have claimed the downstream end, while the Wood Ducks dabble in the waters upstream. The geese will leave as soon as their young are adept fliers. But I’ll likely see the family patrolling the floodplain for about a month before they leave. More exciting than these waterfowl is the return of the Belted Kingfishers. Every day now, I see and hear one flying the length of our adjacent creek, calling raucously before it settles on a good fishing perch. The water birds are here because the creek is healthier than it has been in recent springs. Water levels are back to optimal levels, thanks to abundant rains. The surrounding wetlands are very, very wet, dissected by many water-filled channels, where crayfish and frogs thrive. The cinnamon ferns have unfurled their fiddleheads, the glossy green leaves of Atamasco Lilies promise imminent flower shoots, and any day now I expect to spot Jack-in-the-Pulpits poking up out of the mud. My two gorgeous early-blooming Magnolia acuminata varieties have been perfuming the air and delighting the eye for several weeks now. ‘Butterflies,’ as usual, was the first variety to bloom, its 25-foot tall frame covered in deep yellow blossoms. 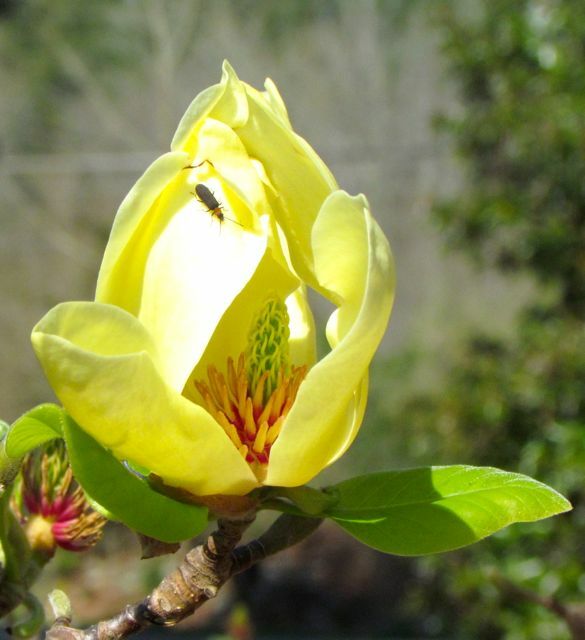 One of the last Magnolia ‘Butterflies’ blossoms. 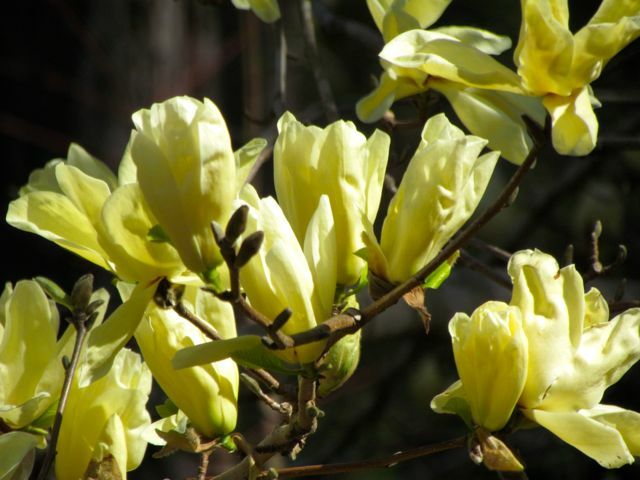 Magnolia ‘Elizabeth,’ now 50 feet tall, started opening her paler yellow blossoms about a week after Butterflies started. She still sports many gorgeous blooms, but I fear the mini-heat wave we’re getting this weekend will finish off the display all too quickly. Magnolia ‘Elizabeth’ — 50 feet of spectacular! 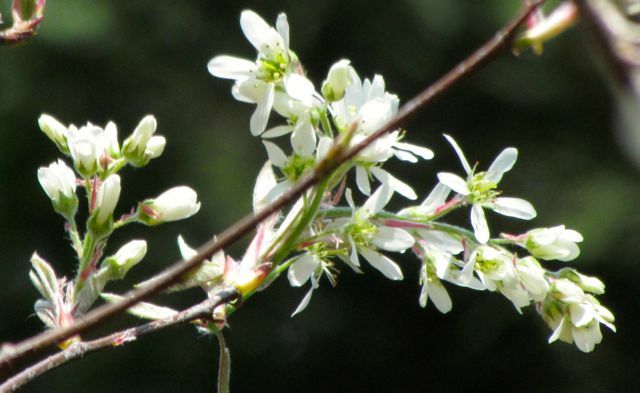 In the last few days, my three Serviceberry trees have begun opening abundant pure white flower clusters. I think last summer’s rains were good for them. They’ve never been more covered in flowers. Maybe this will be the year they produce enough fruits for both the birds and me. Apple Serviceberry blossoms. Pollinators adore them. The pink centers get bleached out a bit by sunlight, but they are lovely. 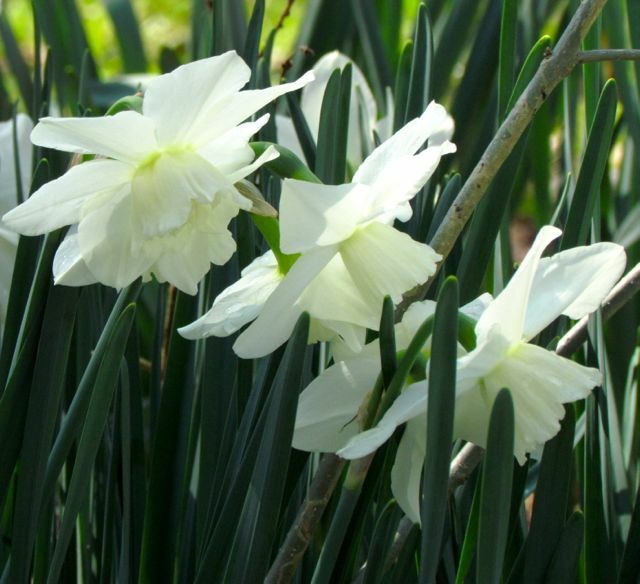 These pure white, ruffled blossoms are especially elegant. 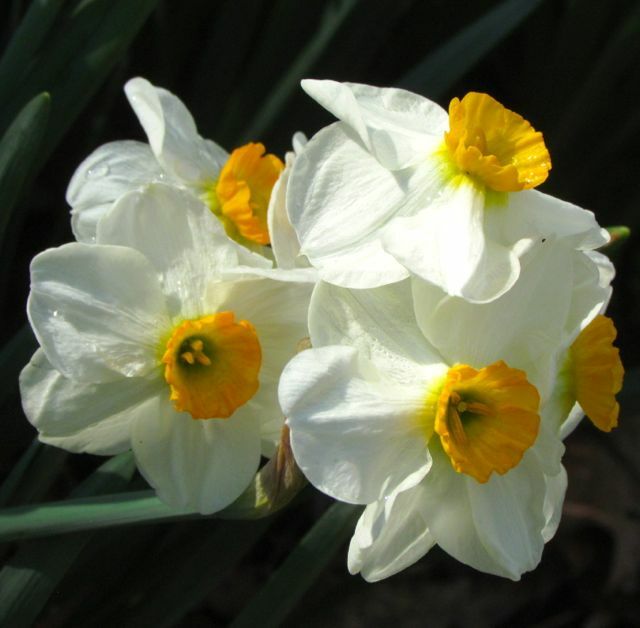 These bloom in tight clusters for an instant bouquet effect, and their fragrance is super sweet. 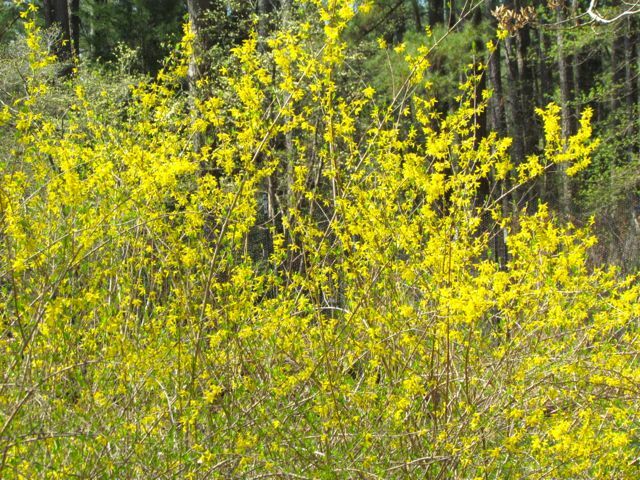 The previous owner had planted forsythia, a ubiquitous southeastern spring landscape shrub. I relocated the bushes from my front door to an area near my road. 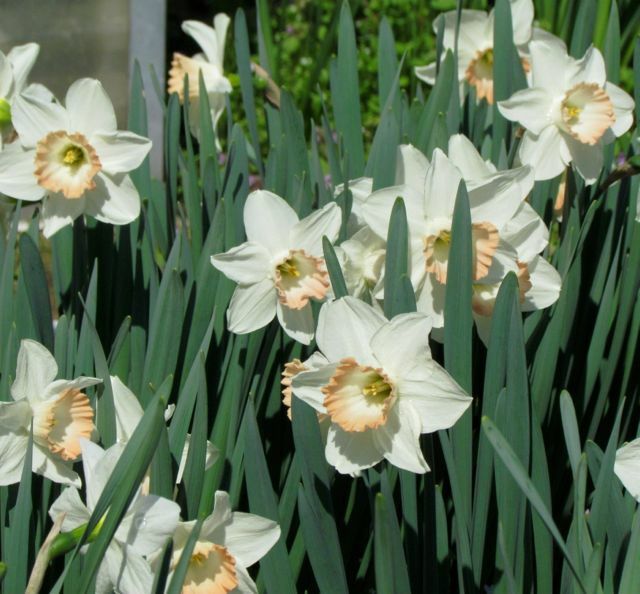 Their abundant blooms seem to indicate they had no objections. It isn’t spring in the southeast without sunny forsythia flowers. 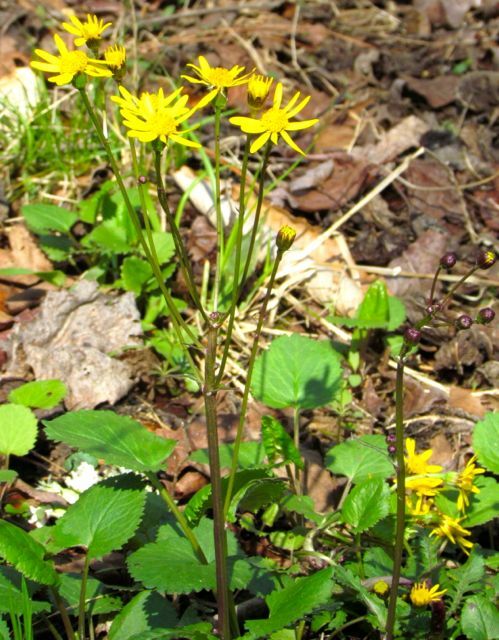 Golden Ragwort is an easy wildflower to add to southeastern landscapes. The earliest blooming native deciduous azalea on the north side of my yard is about to burst into bloom. The other species/varieties are full of swelling flower bud clusters. 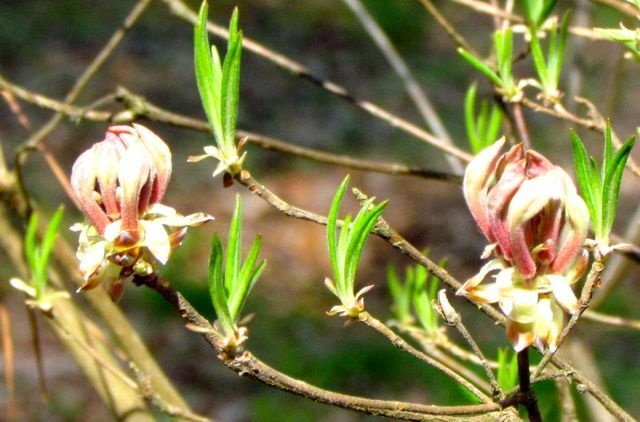 Pinxterbloom Azalea will be the first native azalea to bloom, as usual. The spring ephemeral wildflowers I showed you in my previous post are zooming through their life cycles as promised. Bloodroots now sport pointy seed capsules, their lovely white flowers gone with the wind. 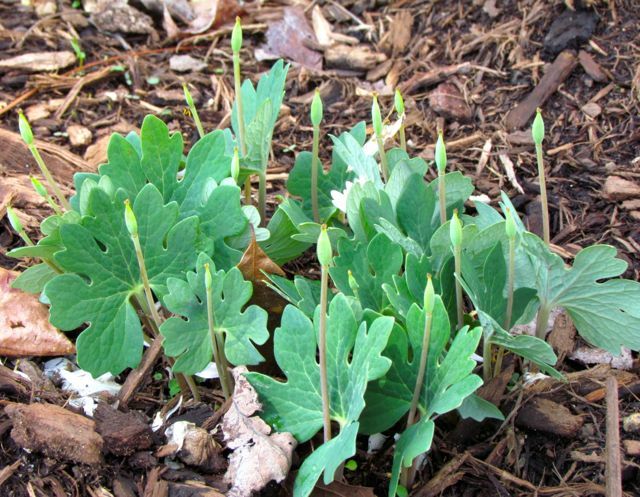 See the swelling round flower bud between the two Mayapple leaves? It will be open any second now. But the spring veggies are looking good, despite mini heat waves, heavy rains, and occasional frosts. And the summer vegetables, herbs, and flowers are growing tall and eager safely tucked in the greenhouse, waiting for more stable weather and weed-free beds. Aye, there’s the rub — weed-free beds. I see many pollen-filled, sweaty days of joint-punishing work in front of me. But all the hard work pays off times ten when we dine on fresh-picked salads, juicy tomato-and-basil sandwiches, and green beans the likes of which you’ll never taste unless you grow them yourself. And when I need a break from the veggie garden, I renew my resolve with a flower-filled walk around the landscape. Nothing puts a fresh spring in my step better than Spring! 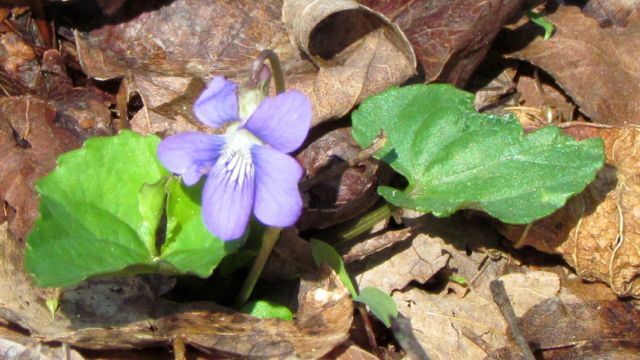 Even my “lawn” is adorned with many wildflowers, including gazillions of violets. 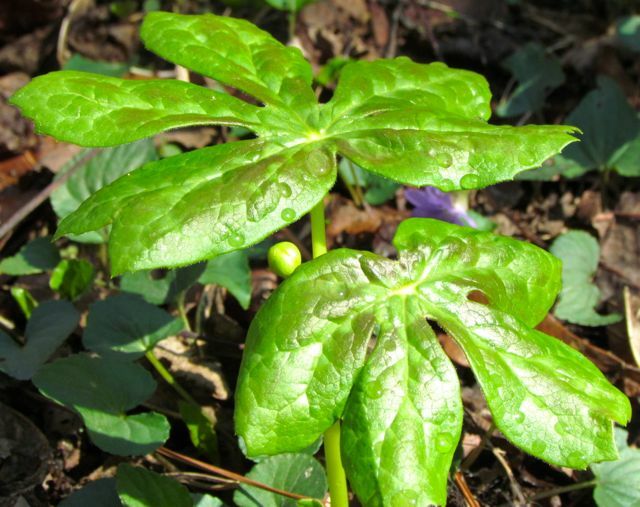 This entry was posted on April 12, 2014, 4:10 pm and is filed under Favorite Plants, Native Wildlife, piedmont gardening, Vegetable Gardening. You can follow any responses to this entry through RSS 2.0. You can skip to the end and leave a response. Pinging is currently not allowed.